Pier 2, located in Kaohsiung, Taiwan, is an abandoned warehouse site turned art district. It is marked by the gigantic yellow characters 駁2, Pier 2, on a watch tower and many colourful statues/sculptures. I am not sure what they signify, but here they are! Pier 2, an abandoned warehouse site turned art district. A gigantic kite attached to one of the warehouses. It’s so colourful it makes me happy. Red monster and man statue. Yes, they have a Minion exhibition too (background). These sculptures female and male statues line the main walkway. Each set has different patterns and styles, but the same helmet + hammer, straw hat + boots combination. At the far end, there is a park with large sculptures on what used to be train terminal. The large sculptures have a very dramatic effect on the train-tracked green space. 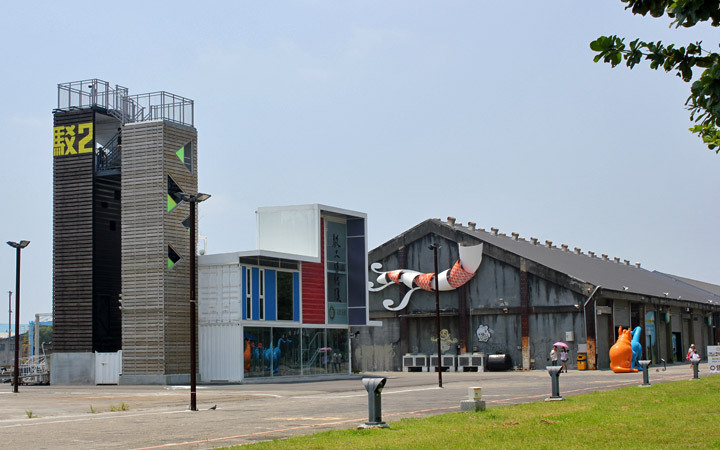 Similar to the Trick Art Museum in Odaiba, Japan, it is fun with friends time! No matter how hard they tried to lie on the bed, the opposing force was too strong. It’s not easy being upside down… almost lost my sunglasses! I flew off the bike! At the other end of the art district, we found a place where they served pineapple cake and tea. Here is the free taste-tester! The pineapple filling is not fully blended, giving it the dried pineapple texture. I adore this stuff! !